I knew I was really going to like Cedar Key, when local oysterman Mike Davis, who was perched on a bar stool opposite me at the funky waterfront Tiki Bar, revealed the secret of happiness the way Tom T. Hall wrote songs: “A smoked mullet, a cold beer, and a hot woman.” The Tiki Bar, with walls made out of empty wine and beer bottles and located behind the colorfully painted 1950s style five-room Low-Key Motel and RV Park, was just one of many fascinating and fun joints we visited, and Davis, just one of many colorful locals we were fortunate enough to encounter during the two and half days last week Linda and I spent with Amelia Island friends Rick Scott and Ann Weller bouncing around Cedar Key, a string of tiny islands four miles out in the Gulf of Mexico connected by a series of bridges, much like a miniature Florida Keys. However, with a population of less than 800 bumping into locals isn’t a problem unless you’re looking for the elusive Charles (Moe) Beckham, but more about him in a minute. Located an easy three-and-one-half hour, 160-mile drive across state from Amelia Island, Cedar Key and Fernandina Beach share a common link as David Levy Yulee’s slave-built railroad connected the two towns from the mid-1860s until 1932, when the last train departed Cedar Key. 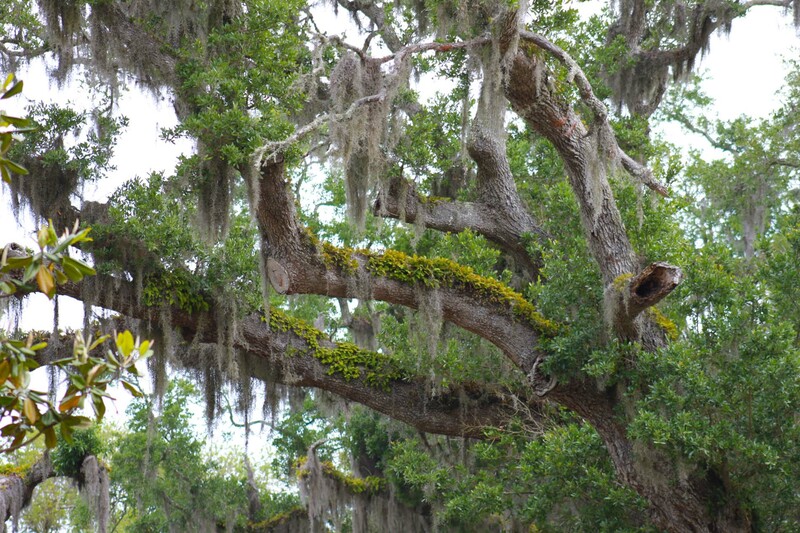 Located in Levy County (Yulee’s original name) the former U.S. senator and once imprisoned traitor, is not held in as high esteem thereabouts as he is in Fernandina, and there are no statues of the 18th Century scalawag in Cedar Key. In fact the folks at the Cedar Key Historical Museum will openly chat about Yulee’s Ft. Pulaski imprisonment following the Civil War, among his other transgressions. 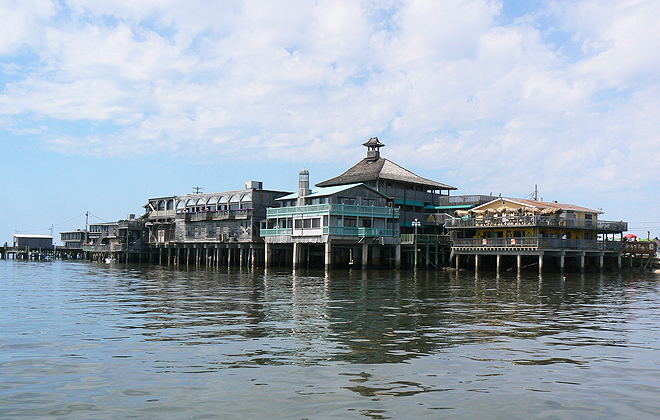 The heart of Cedar Key is Dock Street, a multicolored series of restaurants, shops, pubs, and boutique hotels and motels suspended over the Gulf of Mexico on the town’s waterfront pictured in the above photo. The nine-room Harbour Master Hotel, where we stayed had views of the Gulf from every window in our room and was next door and across the street from the Big Deck Bar, Steamers Clam Bar & Grill, Black Dog Bar and a lot more fun places with equally cool names. Pay attention Fernandina Beach as this is a template for a successful waterfront if the town ever gets it act together and starts focusing on economic issues instead of puppy mills, hearing-impaired fish, chickens, plastic bags, and other feel-good issues better handled by organizations designed specifically for those purposes. The series of islands making up the Cedar Key community are as colorful as the folks living there with names like Kiss Me Quick, Dog Island, Snake Island, Boogie Ridge, Deadman’s Key and Candy Isle. Locally harvested clams, oysters and local fish, including (smoked) mullet — so elusive on Amelia Island — are sold everywhere. From what we could see at the various piers and processing facilities the fishermen were busy and based on conversations we had with them their hard work was making them prosperous as well. While smoked mullet dip was plentiful, the smoked fillets I eagerly sought apparently depend on old-timer Moe Beckham, a local legend, who we were told by residents makes the best smoked mullet on the island or anywhere else. We were also told by these folks that octogenarian Moe, who sells his fish and plays air guitar at an umbrella-covered table on Highway 24, whenever he feels the urge, also delivers to local shops and has a relative on Amelia Island, but it’s unknown whether this relation can catch, much less smoke, a mullet. We never did meet Moe, despite a number of locals calling him and leaving messages on our behalf, but did snag almost a quart of his smoked mullet dip and three huge smoked fillets as we were leaving town at a joint at the intersection of Highways 19 and 24, where, according to the young girl handling the cash register, Moe had just dropped off his smoked delicacies an hour or so before we arrived. Another connection to Amelia Island is Cedar Key’s Island hotel, built in 1859 as a general store and which today provides 10 period-decorated rooms. It resembles the architecture of Fernandina’s 1857 Florida House with five flags (USA, Florida, FSU, U of Florida, & U of Georgia) instead of the Florida House’s eight flags hanging from its balcony; boasts its share of local ghosts and also has a bar with a mermaid decor. In addition to local seafood The Neptune Bar’s menu features a bizarre heart of palm salad originated by former owner Bessie Gibbs that is topped with a special dressing consisting of peanut butter ice cream. I tried it because Oysterman Davis said heart of palm is a fancy term for “swamp cabbage” and my Indian Rocks Beach cousin Lonnie, told me it was worth the trip up there just for the salad. He was right. It was unexpectedly delicious. The Lounge has an interesting history as well and the painting behind the bar of Neptune with a mermaid on either side contains three bullet holes as a reminder of the time a local fisherman armed with a pistol confronted the bartender there about an alleged affair he was having with the irate fisherman’s wife. Three shots hit the painting while the fourth left the lounge looking for a new bartender and locals with a story to tell in a variety of different ways. And the stories just kept coming. For example, while enjoying a fried egg and sausage biscuit sandwich with a side bowl of creamy, buttery grits at the Bake My Cake eatery our last morning in town, an article in the weekly Chiefland Citizen newspaper “jumped” out at me. Headlined “Teen injured by jumping sturgeon” it related how a 14-year-old Fanning Springs girl boating on the nearby Suwannee River was hit by a four-to-six foot sturgeon that “leapt out of the water and into the boat hitting and knocking her unconscious.” According to the article the surging sturgeon whacked the young girl so hard she suffered a concussion and required medical staples to close a wound in the back of her head. While we talked out loud among ourselves about how this surely was a rare once-in-a-lifetime event the cheerful young server waiting on our table turned deadly serious and blurted out” Drop and roll! That’s what you do if you see a sturgeon leap out of the water.” Three local firefighters taking a Bake My Cake coffee break confirmed the young lady’s warning telling us that when you see horseflies, a favorite sturgeon snack, on the water “that’s the time to get nervous.” The Florida Fish and Wildlife Conservation Commission also confirmed that sturgeon attacks are common and to be safe urged people to keep passengers off the bows of boats because of them. Who knew? Cedar Key is one of those places like Fernandina Beach, where you look around, collect your thoughts and say out loud: “I could live here.” I won’t be moving there, but I’m sure going back again very soon. And then again and again after that. What’s In A Name? According to Mary Maguire’s online Independent it appears Fernandina Beach is getting closer to selecting a new fire chief, as she reports six finalists have been interviewed out of those who submitted resumes. I’m certainly not qualified to make a selection, but if it was up to me my pick would be based on the names of two of the applicants: Current Deputy Fire Chief in Orlando, Rusty Nail would be my first choice followed by Charlotte County, FL Chief Dennis Didio. Those names just roll off the tongue. A Quartet Of Louts: No wonder the U.S. Congress is dysfunctional when the two parties keep selecting the likes of Harry Reid, Nancy Pelosi, Mitch McConnell and John Boehner as leaders. The four of them have absolutely nothing to recommend them for leadership positions and they are all physically unattractive: The raspy voiced weasel Reid looks like an unmade bed; The dim “You have to pass the bill to find out what’s in it” Pelosi looks like someone just threw a bucket of cold water in her face; tubby and clueless McConnell could be the winner of the Mr. Magoo look-a-like contest; and the perpetually tanned Boehner may even be dead as I’ve never seen him even blink. Even when reading scripts this quartet is deadly dull and unconvincing. And yet their colleagues keep selecting these louts to be the face and voice of their respective parties. It’s scary if that’s the best we’ve got and it’s understandable why practically nothing gets done and what little that does get done is a mess. “Bo, You Don’t Know Diddley!” And NY City Teachers Don’t Have To Either: A federal judge in New York has struck down a test used by New York City to vet potential teachers, finding the test of knowledge illegally discriminated against racial minorities due to their lower scores. At first glance, the city’s second Liberal Arts and Science Test (LAST-2) seems fairly innocuous. Unlike the unfair literacy tests of Jim Crow, LAST-2 was given to every teaching candidate in New York, and it was simply a test to make sure that teachers had a basic high school-level understanding of both the liberal arts and the sciences. “Instead of beginning with ascertaining the job tasks of New York teachers, the two LAST examinations began with the premise that all New York teachers should be required to demonstrate an understanding of the liberal arts,” Judge Kimba Wood wrote in her opinion, according to The New York Times. Drinking, Dining & Dancing: There are just two places on Amelia Island that I know of to get the special New Orleans Muffaletto: Lulu’s on South 7th Street downtown (call ’em at 904/432-8394) and Sandy Bottoms (Call ’em at 904/310-6904) at Main Beach. Lulu’s Brian Grimsley has been consistently providing this tasty specialty for a while and it is very good with Brian using Italian ciabatta bread for his $10 sandwich. Brian will start providing them again this coming week. Sandy Bottom’s Nick Hartley, when he can’t purchase the special bread he needs from his vendor, makes his own, and this past Sunday did a great job. The tapenade was excellent, the meat and cheese thick enough, and the bread as close as I’ve tasted outside of Louisiana. The sandwich, which comes with a side, is a bit pricey at $17 but if you try and eat more than half of it, you’ll understand that the price tag may be worth it as it’s a meal for two with some left over. Oh, and for the first time, Nick smoked some 10 pounds of mullet, priced at $12 each, a first that I am aware of at Sandy Bottoms. I’m interested in what other folks think as those that read this blog regularly are familiar with my prejudice concerning smoked mullet and know I’ve never eaten one I didn’t like. I had a couple of beers at the recently opened Beech Street Bar & Grill (corner of South 8th Street and Beech Street) where I sat at the classy 20-stool bar and chatted with congenial owner Tim Lawther, a Michigan native and a 20-year veteran of the Jacksonville restaurant scene, who is currently looking for a home on Amelia Island. Tim’s new eatery, which has rapidly been picking up favorable reviews from tourists and locals, has put an emphasis on the uniquely designed bar with tables scattered throughout the room, but has other equally attractive areas for those that don’t want to eat in the barroom area. The cozy zig-zag bar even accommodates a wheelchair imbiber who wants to belly up. The eclectic menu contains some interesting items ranging in price from $5 for a soup appetizer to $29 for an entre of beef bordelaise with purple Lyonnais potatoes and green beans and they even offer an old Canadian favorite, poutine, a messy pile of French fries, covered with cheese curd and gravy for $9.50. At the BSB&G they even toss short ribs on the pile too. I heard from a lady who knows food and is deeply involved with island bars and eateries that the BSB&G crab cakes are the best she has ever eaten, including her own homemade ones. I predict this place will have a long and healthy life among locals and visitors. They are closed Monday, open 5- 11 pm Tuesday – Thursday and 5 – 2 a.m. Friday-Sunday, and will obviously pick up traffic from downtown eateries that have been keeping banker’s hours while the bar is ideal for clusters of regulars who’ll soon discover its charm. Call ’em at 904/572-1390. FYI: The 14year old girl that got hit by the fish in Fanning Springs died from the injuries. Great blog about a great place! Understanding that you visited all the bars and restaurants you probably didn't have time to visit the Cedar Keys Museum. It's the place to find out all about the first railroad in Florida that was built by your buddy - DLY. That's something that you can't find in the FB Museum. Dave....when I was in college at the University of Florida in Gainesville and the guys really wanted to impress one of those cute little Gator Girls, we drove them to Cedar Key! Of course, that was a few years ago, but it's still a spectacular location! Excellent blog Dave - missed you last week. Caught your early deliberate mistake - David Yulee was a 19th century scalawag. Will collect my prize (a mini pretzel!!) at The Mermaid Bar on Tuesday. Dave, Judy and I loved your Cedar Key report. It is a most unique and charming place. No traffic lights, only a small grocery store, and no newsstands with USA Today. When you drive west from Gainesville you are truly In old Florida--only open country until to get to Cedar Key. Each time we've been there we've enjoyed boat tours around the "keys' and one to the Suwanee River. Captain Doug has sold the boats called something like Island Adventures. There is a restaurant right in the center that serves fantastic clam chowder. Sorry you missed it. Old Dave got it right in "A Quartet of Louts" and to Dave's credit, he didn't give his chosen ones a free pass. This cast of charterers that direct the destiny of our Nation, could star in their own Movie. Anybody remember the 1980's classic "Airplane" starring Loyd Bridges and Leslie Nielson ? Leslie was a passenger on the plan when the pilot and co-pilot were injured. Leslie was a retired airlines pilot who was afraid of flying, but surely, he could save the passengers and crew. But don't call him Shirley. Quote, Mark Twine: "Sometimes I wonder whether the world is being run by smart people who are putting us on, or by Imbeciles who really mean it?" What would they call this Movie? This blog was EXCELLENT! The correct balance given to each category (thoroughly enjoyed the portions dedicated to local lore) - even the political portion gave it's due to "all" of the culprits (none of them are innocent). Once again Dave you have it all wrong--McConnell looks like Howdy Doody, not Mr Magoo. If you have never seen Boehner blink, you just not watching. He does it evey time he crys on camera. On the plus side I am happy to see you call out the GOP as well as the Democrates for lack lack of Leadership. Not to fear however either Hillary or Rand will fix it all.